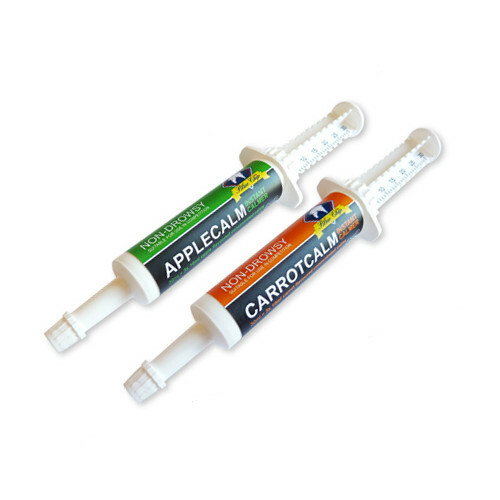 Blue Chip Applecalm & Carrotcalm Instant Calmers are a naturally flavoured, concentrated instant calmer. Each syringe contains three concentrated calms which use a unique combination of fast acting magnesium L-tryptophan and vitamin C. It is a non-drowsy formula suitable for use in competition. Give 1 x 10ml measure (one calm) one hour before a stressful situation or competition. If necessary follow with a further 10ml half an hour later. Applecalm and Carrotcalm are designed to be fed on an empty stomach. Avoid feeding hard feed for 30 minutes after usage. There are currently no questions for Blue Chip Applecalm & Carrotcalm Instant Calmers - be the first to ask one!